It is the highest amount the agency has ever requested. 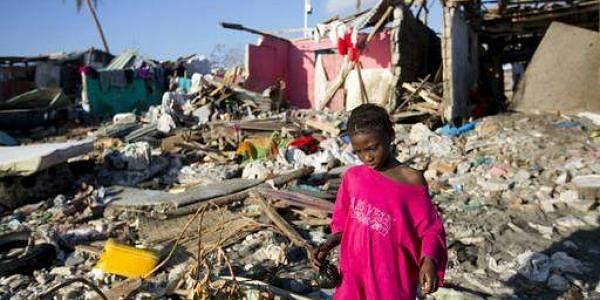 This is a October 2016 photo of a girl as she walks through debris where homes once stood after Hurricane Matthew hit Jeremie, Haiti. GENEVA: The U.N.'s humanitarian aid coordination agency says it and partners require a record $22.2 billion next year to help people hit by conflict and disasters around the world, a 10 percent increase from this year. The appeal announced Monday from the Office for the Coordination of Humanitarian Affairs seeks to help nearly 93 million people in 33 countries â nearly two-thirds of them in Africa. More than one-third of the total appeal â $8.1 billion â aims to help people in Syria and refugees from it, and another $4.4 billion would support people inside or fleeing war-torn Yemen and South Sudan. It is the highest amount the agency has ever requested, said OCHA chief Stephen O'Brien. "This is a reflection of a state of humanitarian need in the world not witnessed since the Second World War â more than 128 million people urgently need our support and solidarity to survive and live in safety and dignity," he said. The 93 million among them targeted by the appeal are some of the most desperate, he added. "More than 80 percent of the needs stem from man-made conflicts, many of which are now protracted and push up demand for relief year after year," O'Brien told reporters in Geneva. The single highest amount in the appeal is for $4.7 billion destined for a Syria "Regional Response Plan." That would support countries like Turkey, Lebanon, Iraq, Jordan and Egypt that have taken in some 4.7 million Syrian refugees who face deteriorating conditions after more than five years of war. Appeals like the "Global Humanitarian Response" generally fall short of their targets and are based on estimations, but set important benchmarks for need around the world and hundreds of OCHA's humanitarian partners. International donors have provided $11.4 billion to the 2016 global appeal â just over half the requirement â which has created the largest gap ever in funding, OCHA said. Conflicts including those in Yemen, Syria, South Sudan and Nigeria were the main driver of the appeal, the agency said. But it said in a statement that droughts and other natural catastrophes are "pushing vulnerable communities to the brink of survival."